A few weeks ago you may have read my post about project 365 I have been getting really positive feedback on this one and wanted to update. The family has been very cooperative for the most part. My favorite picture of the week is very hard to choose I mean I got some good ones so I will throw them in and let you decide YOUR favorite. 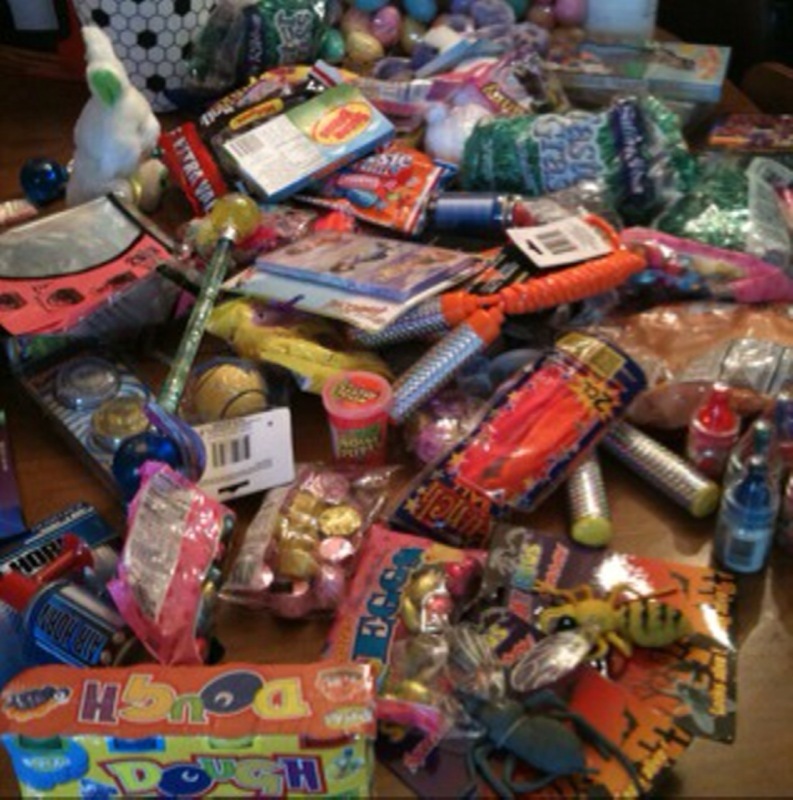 Sunday was easter so of course you got to have a pic of the day of all the crap that goes in the basket. An interesting thing happend while on the way to easter dinner. Hubby had me take several pictures of him the whole while commenting on how he liked project 365. He did not like the pictures even while I was taking them because he did not like the angle of the sun etc, which lead to a posing session. He is going to use a real camera for his picture of the day which for him will be successful I think because he always has his camera on him for work. I can not wait to see his pictures that man will come up with some good ones. 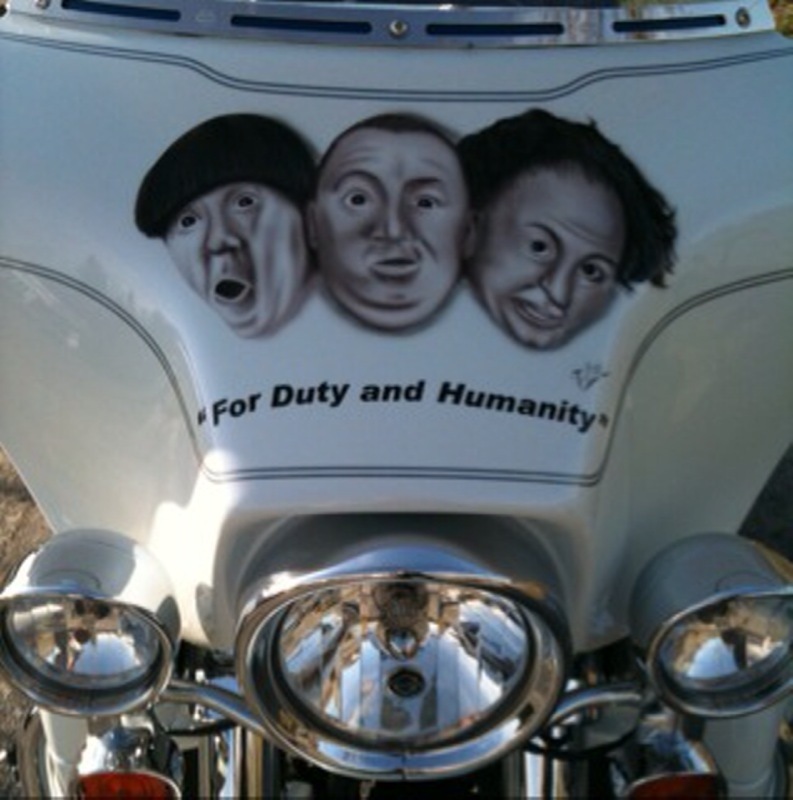 Here is my Monday picture it is of a sleek looking Harley with the Stooges painted on the front. On Tuesday there was a bank bowling event where the Plaistow Office went head to head with Kingston. I was able to catch up with a great person Lois who I miss in the branch a lot. I do not know how we got on the subject but I mentioned project 365 to her and she really liked the idea. She found the cloud app which is where you take a picture of a cloud a day she is really excited about both apps. I told her I was old and would not remember to take a picture of the day and a cloud, but if she sent me some of hers she may inspire me. 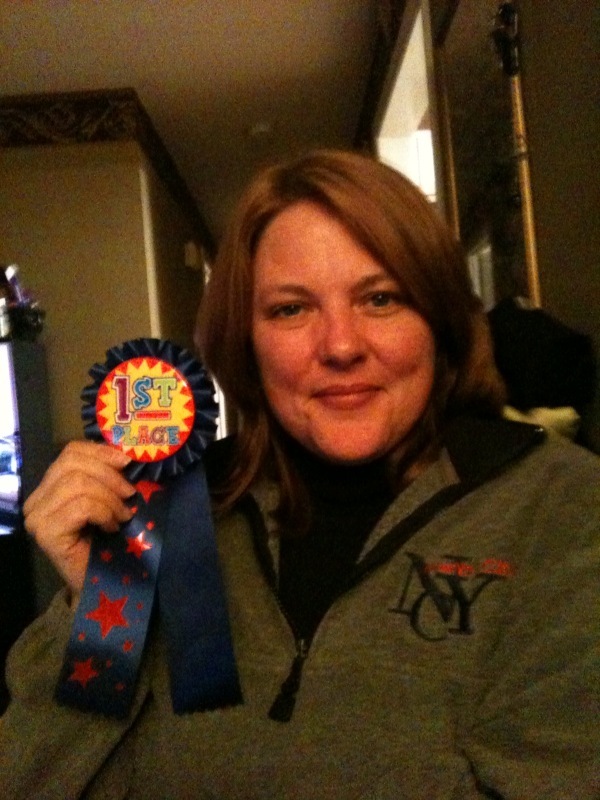 When the bowling night was done there were several awards and I got high score and a ribbon which of course was my picture of the day. BTW Lois is having fun with the cloud app! On Wednesday there was a customer who came into the bank with her mother. While she waited in the lobby playing with her I phone I being me asked what her favorite app was you never know she may have a good one. Hers was solitare (I waste enough time on Farmville I am not doing solitare too) I told her mine was project 365 and showed her a few of my fav’s. Of course I showed the first one a picture of bedcovers where I dropped the phone in the bed while taking the picture, son’s first sushi, hubby eating his b day cake, duct tape wallet, 5 superbowl rings etc.. She told me her mother had just purchased an I Pad which I could not believe I mean this lady was old I didnt even think she could see the i pad. On her way out of the bank the daughter waved her phone in the air and said she was already downloading Project 365. 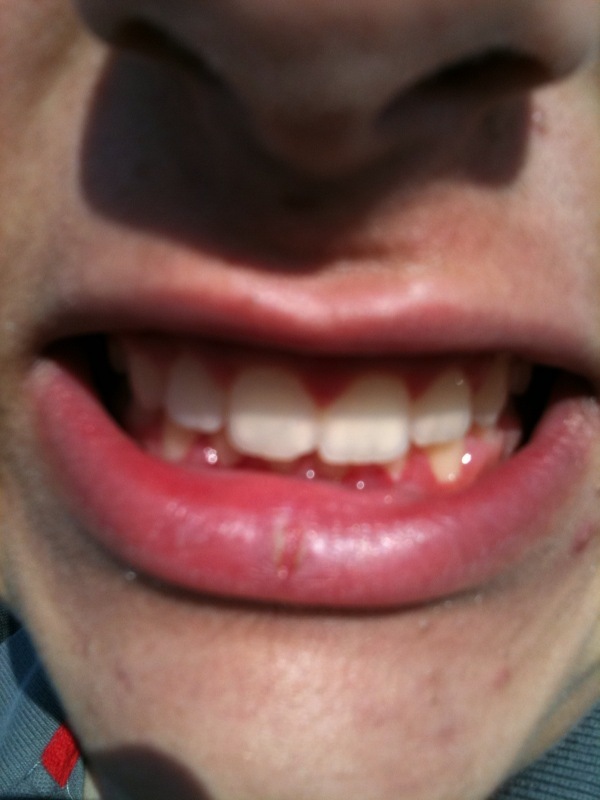 My pic of the day was my son getting his braces off. These people in a way I feel have been inspired by me and what i am doing. This is so fufilling for me as an artist I mean I am part of the reason for them taking pictures and moments in their lives and recording them daily. DAILY that is the commitment and they are doing it I am so proud of them and hope they spread the love and get someone else doing the same thing. Now for the big announcement……….Polymer Clay Cafe wants to publish my next project Woo Hoo for me! I am so excited and really can not wait for it all to come together. This will be the second time I have had an article in the magazine. The first time I really did it because of my son. If not for him I may not have faced my fear and submitted. The story is in the intro of the article it was Vol 7 No 3 published in April of 2009. This time with a lot of inspiration from fellow clayers I have what I think is a unique polymer clay piece. I will update while going through the process. If I can inspire at least one of you to take a picture/cloud of the day or to submit to a magazine I will feel all this typing alone at my computer and taking the freeken pictures of the day have all been worth it tenfold! This entry was posted on April 10, 2010 at 2:55 PM and is filed under inspiration. You can follow any responses to this entry through the RSS 2.0 feed. You can leave a response, or trackback from your own site. It is super easy we just subscribe to each others blogs! I had computer problems this week but will check out your blog tonight when I get home! I want to thank you for liking and commenting on the blog thank you for that it means a lot to me.